Back in March Helen Dacre talked in this blog about how we define the start of Spring. She said that, for many people, the first indicator of the onset of Spring is not a particular date but an event in the natural world – and for her it is when the daffodils flower in her garden. Many people keep records of the dates of natural occurrences such as this. Some records maintained by several generations of the same family even go back well over 100 years. The Woodland Trust, in conjunction with the Centre for Hydrology and Ecology, maintains an online database of these phenological records which can be accessed and even added to by the general public through the Nature’s Calendar website. Using this website one can see how events such as flowering and leafing dates of various plants vary from year to year. One of the main influences on the seasonal cycle of the natural world is of course the weather, and in particular temperature. Over the past few years we’ve been treated to quite a range of variations in the temperature in late Winter and early Spring and it is the weather at this time that has a big influence on the first appearance of most of our native Spring flowers. March 2013 was one of the coldest in the last 100 years, and unusually the mean temperature for the UK that month was actually lower than February 2013 – a fact made all the more remarkable because February itself was almost a degree colder than the 1981-2010 mean. By contrast February and March 2014 were rather warm, and then February and March 2015 were almost spot on normal. We’d expect such variations in temperature to have an affect on flowering dates. Bluebells are an iconic species, and the appearance of great carpets of these flowers is a sign that Spring is starting to make the transition towards Summer. 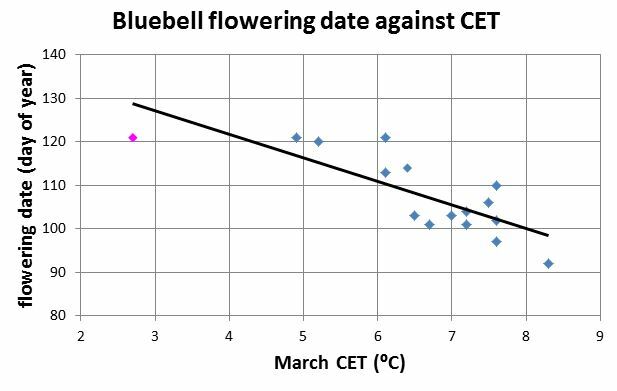 Using data from the Nature’s Calendar website, it is possible to study the relationship between bluebell flowering date and Spring temperatures, and in particular March temperature. The graph in Figure 1 shows the relationship between the modal first flowering date of bluebells (i.e. the day of the year on which most reports of bluebells coming into flower was made) and the mean March Central England Temperature (CET) for the same year, using data from 2015 and the previous 15 years. There is a clear inverse relationship here, with colder weather in March leading to later flowering of bluebells. The best fit line indicates that bluebells come into flower on average about 5 days later for every 1 degC drop in the March CET. Figure 1. A graph of flowering date of bluebells (day of year) against Central England Temperature (CET) in March (⁰C). Data points are for 2000-2015, with 2013 shown in pink. There is something interesting going on at the cold end of the graph. The pink point, which represents 2013, shows that although the March CET was over 2 degC colder than the next coldest March in the past 15 years, the bluebells didn’t flower any later in 2013 than the two years in which the March CET was around 2 degrees warmer. What’s going on here? Bluebells are most common in a wide variety of typically deciduous woodland, and during April and early May leaves are starting to appear on the trees above them. At first the canopy is rather sparse and leaves tend to be rather translucent. During May more leaves appear, increasing the density of the canopy and the leaves tend to turn darker as they start to photosynthesise. This reduces the amount of light reaching the woodland floor. Bluebells seem programmed to get their flowers out before the light levels fall below a critical level, so that even in years when Spring is rather cold, bluebells will still produce some flowers before the available light levels drop below this critical level. Removing the 2013 data from the graph shows that bluebells will actually flower about 8 days later for every 1 degC drop in March CET, but if they haven’t flowered by about day 120 (30 April) then the light level response cuts in and they produce some flowers anyway. The Nature’s Calendar website contains a wealth of seasonal data, not just for flowers, but also for trees, shrubs, birds, insects and amphibians and I’d encourage anyone with an interest to take a look and maybe even consider making their own contributions to the dataset. This entry was posted in Climate, Phenology, Weather and tagged Phenology, spring flowering. Bookmark the permalink.